Best of the Week: Sharp's move into OLED TVs, special edition KEF LS50, Beyerdynamic Aventhos and more | What Hi-Fi? This week Sharp put plans in place to move into production of OLED TVs, KEF launched a special edition of its LS50 speaker and Cyrus launched its affordable, compact OneLinear speaker. 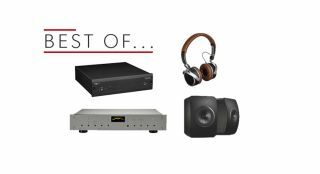 Elsewhere, we had reviews of Beyerdynamic's Aventho Wireless headphones, Musical Fidelity's LX2-LPS phono amp and Burmester's 100 Phono preamplifier. Sharp is stepping up its involvement in OLED panel production. This comes after Universal Display announced the extension of its partnership with Sharp, which includes producing materials for OLED displays. This will give the Taiwanese brand a bigger foothold in the OLED display market, and put it into direct competition with LG. Celebrating five years since its inception, KEF's LS50s now come in a brand new finish and sport a number of new touches. Now available in a matte black coat, each speaker comes with its own diamond cut deco plaque and unique laser-etched serial number. The internals mirror the Award-winning LS50s and the pricing is the same too. The new OneLinear is Cyrus's attempt to create a compact, affordable bookshelf speaker. The OneLinear will be available from the end of February, priced £350. Or you could also buy them as part of a bundle with the One amp for £1050. "Well made headphones with a lot of good ideas behind them"
An interesting feature of the Aventho Wireless headphones is its use of personal sound profiles. Through a companion app, it measures how well you hear frequencies and tailors your audio accordingly. The Aventho Wirelesses offer a sound that's insightful, with a smooth treble and punchy bass. However, they could be tighter in terms of timing, and the sound does lack dynamism. They're likeable though and the personalised sound is a nice touch. Impressive, but they just fall short of the best. "This is a classy little product"
Musical Fidelity's LX2-LPS is an phono amp that's both affordable and caters to MM and MC cartridges. That's something of a rarity at this price. Impressively, the LPS retains the same character for both with its open, full-bodied presentation and fluid dynamics. It lacks some punch and drive when compared to the class leader, but even so, it's an engaging performer. "A beautifully made and engineered product that sounds lovely"
After the best phono stage money can buy? Then put the Burmester on your list. In short, it's a fluid, dynamic and informative performer, with an impressive sense of sonic scale and stability. Those with deep wallets will find the Burmester a beautifully made product that sounds great.